Description: This young musician is gifted. She plays her instrument beautifully. Create a symphony of style for this young prodigy. 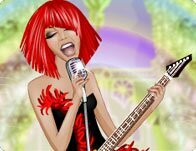 Instructions: Use your mouse to click on the floating clothing icons and make over this musician to be with an assortment of colorful one of a kind dresses, shirts, skirts and designers jeans. Accessorize with the perfect instrument and listen to her jam out some fun tunes. She's a music enthusiast with an urban style and a rock n roll smile. Dress this designer doll in fashionable, danceable clothes that hip, hop and pop! She can sing, she can dance, she can party and romance! This Detroit diva knows how to get down in plenty of fun and funky fashions!